Wikipedia lists approximately 50 American neighborhoods that are known, officially or unofficially, as “Little Italy”. A couple of weeks ago I walked around the Italian neighborhood in San Diego, and delighted in hearing Italian conversation around me! Where did all these Italian immigrants come from? Between 1880 and 1920, more than 4,000,000 Italians immigrated to the USA, and most of them came from southern Italy. Like immigrants from other countries, they often formed neighborhoods of like ethnicity. Among them were my great-grandparents, Francesco Arcuri, who came from Calabria in 1887 and found work as a lace-maker in New York, and Josephine Gualtieri, daughter of a shoemaker in the Calabrian village of Scigliano. Francesco lived in America for about ten years before returning to Italy to find a wife. He was about 50 when he married the 21-year-old ‘spinster’. They came to America in 1900, and lived in Patchogue, Suffolk County, New York on Long Island. In his book Long Island Italians, author Salvatore John LaGumina says, “Patchogue was Suffolk’s most thriving [Italian] community in the early 20th century.” LaGumina mentions a large lace-making mill there which employed hundreds of Italian-Americans. Poverty in the Italian south fueled the mass exodus of residents, and opportunity in America gave them direction. 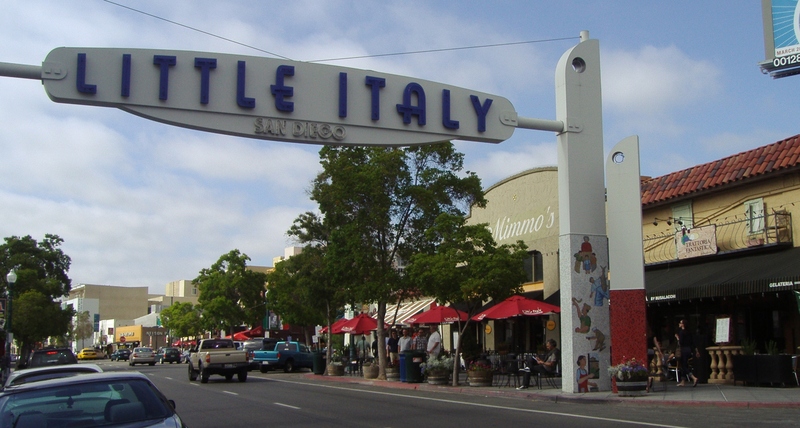 Is there a “Little Italy” near you, or one you have enjoyed visiting? Please comment! This entry was posted in History and tagged Calabria, history, immigration, Italy. Bookmark the permalink. There are so many great Italian restaurants in New York City–not just in Little Italy, either! Diano (in Italian terms) is a “frazione” (fraction, or neighborhood) of the “commune” (town or city government) of Scigliano, which contains several other “frazioni” as well. Diano doesn’t have it’s own town government. Sure wish we could spend another week or two there! When visiting Manhattan with Glenn and Sasha several years ago, under Glenns expert guidance we found a tiny Italian restaurant in what is left of Little Italy in that area. The food was excellent and enhanced by the ambiance, not the least of which was the young Italian girl who waited our table. We went back one more delicious time in the week we spent there. By the way, your great grandparents are from the village of Diano in the (province, state, whatever of Scigliano. If I’m not mistaken. Very nice bit of history you wrote there.